If you're looking to have an entertaining dinner party, try a dinner party cooking game. They are great for small dinner parties of eight to twelve people, and are sure to result in an uproarious good time. 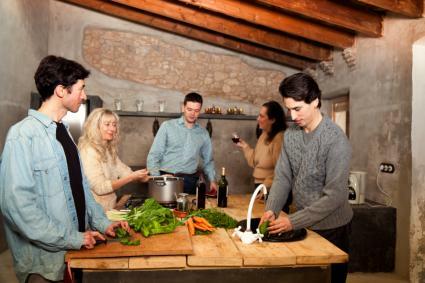 Everyone loves a good dinner party, and if there are foodies in your group, a cooking dinner party is even better. There are a few different types of cooking games ranging from simply answering trivia questions, to games that actually result in a full cooked meal. Something like What's Cookin'? is a simple, yet fun game that lets guests flex their culinary muscles by answering trivia questions in five categories. Cooking games like Stir Crazy are a lot of fun and a great way to break the ice if you're inviting people who don't already know each other. Players divide into teams and then spin to "win" certain ingredients that are all related to a particular type of food such as Mexican or Chinese. In addition, each team gets a stash of "staples" to help create their masterpiece. Each team then goes to create an appetizer, main dish and dessert with their ingredients. If you plan to have guests cook, keep the party to fewer than twelve guests. Do any of your guests have food allergies? Ask the question on the invitation, giving guests an opportunity to let you know in advance. Make a list of the utensils that each team might need. Figure out what you have enough of, and then divide the remaining items among the guest list, asking guests to bring one or two things along with their own aprons. Make sure as you're planning that you have enough cooking space since two sets of meals will need to be cooked in the oven or on the stove. If you're limited on space, you can stipulate that one team has to use the oven and the other team has to use the stove. Invite guests before the normal dinner hour so that they have time to cook and have dinner ready around a reasonable dinner hour. Plan something for people to do while they are waiting for their meals to cook. This is a great time for one of those aforementioned trivia games. Prepare appetizers in advance so that people have something to nibble on when they are not cooking. There are a few places to find a cooking game for your dinner party. Many gourmet stores like Chef Central carry them frequently. You can also check your local party store. However, if you don't find what you're looking for, don't be shy about creating your own dinner party cooking game.